Zachary Flower is a freelance web developer, writer, and polymath. He's built projects for the NSA and created features for companies like Name.com and Buffer. In the first post of this series, we discussed how to set up continuous deployment to AWS for your Docker apps using Codeship. In the second post, we continued with a quick tutorial on deploying new Docker images to Amazon’s EC2 Container Service with Codeship. We’ll wrap things up with a discussion about the similarities and differences of Amazon’s Elastic Beanstalk and CodeDeploy. So, we’ve seen how to deploy Docker images to ECR, but what about Amazon’s other non-Docker code delivery methods? Elastic Beanstalk and CodeDeploy are both very similar deployment products with one major difference: resource management. AWS CodeDeploy is a service that automates code deployments to currently running EC2 instances. This is a similar solution to many atomic deployment services, as it does not provision resources or provide application-level monitoring. Elastic Beanstalk, on the other hand, is a web application deployment service that can launch additional AWS resources (like load balancers and EC2 instances) and deploy code changes. Fortunately, getting set up with both Elastic Beanstalk and CodeDeploy deployments on Codeship is rather straightforward. This section defines a new Docker container using Codeship’s aws-deployment image, using our previously defined environment file, and mounts the project directory to a directory called /deploy within the container. Mounting the current project directory within the container is important because the deployment service needs to be able to actually access the code it is to deploy. While this process is incredibly straightforward, if you’d like to see a practical example of deploying an existing project to both of these services using Codeship, I’ve mirrored the code shown above onto a fork of the Lumen project. Just take a look at the codeship-services.yml and codeship-steps.yml files and you’ll see what I mean. All three posts in this series have shown relatively basic examples of what can easily become a very complicated process. 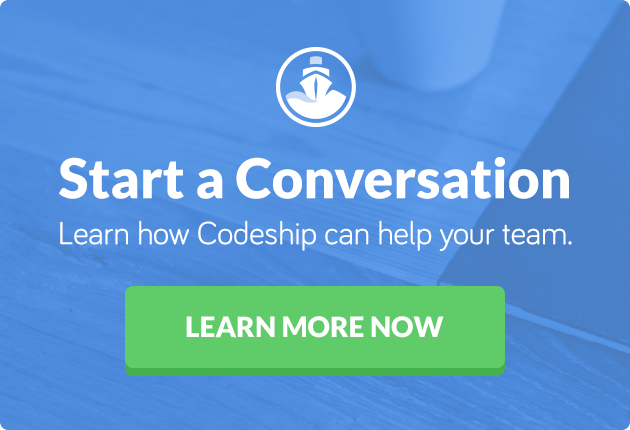 However, by using Codeship, even the most complex deployment process can be handled with only a little effort. AWS isn’t an easy thing to learn; there are a lot of nuances that can take time to take in and understand. But with tools like Codeship, integrating your CI/CD process with AWS is surprisingly easy. This has been Part Three of a series about seploying Docker apps to AWS. Want to read all three parts together? Download our free ebook, Deploying Docker Apps to AWS.